Finally, a new Duel Cafe comic! It's so cute and funny at the same time! Awesome job! I love this cute little treat! I wonder, who gonna eat that BEWD chocolate? OH MY GOSH!!! 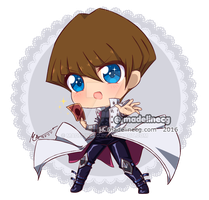 I love how Kaiba is doing his evil laugh with his chocolate!!! XD Oh I love your Yu-Gi-Oh art so much!! I really like how you portrayed the boys and the way you turned a small story into images... And, wow! What a beautiful line you have! It's visualy light and shows how talented you are. Excellent job! haha so funny very cute! Wow a chocolate contest. This is such a great idea. I love what Kaiba did to his chocolate. 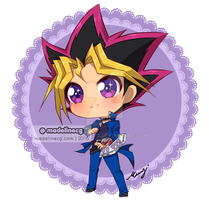 Although Yami and Yuugi look so cute. Nice work. I can relate to Joey TT--TT I know the pain. Aww come and have some virtual chocolate! DAWWWWWWWWWWW the cute!!!! Your art is always cutness overdose!!! Now the Blue Eyes Chocolate Dragon is a card I'd like the eat have! It's special effect is to melt over on the opponent...and they will LIKE IT! Haha yes! And so the player would automatically win XD The only time when both victory and defeat are delicious! ^W^ Yuki's art is magic, ofc I'm here! !